Two phenomena known to inhibit the potential habitability of planets tidal forces and vigorous stellar activity might instead help chances for life on certain planets orbiting low-mass stars, University of Washington astronomers have found. Recent observations have revealed the existence of Complex Organic Molecules (COMs) in cold dense cores and prestellar cores. Small, cool planets represent the typical end-products of planetary formation. Studying the architectures of these systems, measuring planet masses and radii, and observing these planets' atmospheres during transit directly informs theories of planet assembly, migration, and evolution. 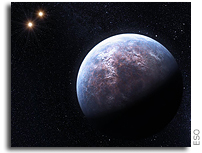 A study by astrophysicists at the University of Toronto suggests that exoplanets - planets outside our solar system - are more likely to have liquid water and be more habitable than we thought. The Astrobiology community deeply mourns the loss of Dr. Antonio Behar, a JPL employee, explorer, colleague, and friend to many. He died in the crash of a small plane on Friday, January 10, 2015, near Van Nuys Airport in the Los Angeles area. Future direct-imaging exoplanet missions such as WFIRST/AFTA, Exo-C, and Exo-S will measure the reflectivity of exoplanets at visible wavelengths. 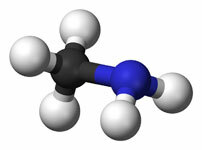 We carried out an experiment in order to obtain the InfraRed (IR) spectra of methyl propionate (CH3CH2COOCH3) in astrochemical conditions and present the IR spectra for future identification of this molecule in the InterStellar Medium (ISM). To understand the evolution of planetary systems, it is important to investigate planets in highly evolved stellar systems, and to explore the implications of their observed properties with respect to potential formation scenarios. We aim to detect methylamine, CH3NH2, in a variety of hot cores and use it as a test for the importance of photon-induced chemistry in ice mantles and mobility of radicals. In the solar neighborhood, where the typical relaxation timescale is larger than the cosmic age, at least 10% to 15% of Sun-like stars have planetary systems with Jupiter-mass planets. In contrast, dense star clusters, charactered by frequent close encounters, have been found to host very few planets. Molecular complexity builds up at each step of the Sun-like star formation process, starting from simple molecules and ending up in large polyatomic species. We investigate the effects of varying Saturn's orbit on the atmospheric circulation and surface methane distribution of Titan. Next-generation space telescopes will allow us to characterize terrestrial exoplanets. To do so effectively it will be crucial to make use of all available data. The formation of complex organic molecules (COMs) in protostellar environments is a hotly debated topic. In particular, the relative importance of the gas phase processes as compared to a direct formation of COMs on the dust grain surfaces is so far unknown. We present an improved estimate of the occurrence rate of small planets around small stars by searching the full four-year Kepler data set for transiting planets using our own planet detection pipeline and conducting transit injection and recovery simulations to empirically measure the search completeness of our pipeline. In this paper we present a series of models for the deep water cycle on super-Earths experiencing plate tectonics. We present an investigation of twelve candidate transiting planets from Kepler with orbital periods ranging from 34 to 207 days, selected from initial indications that they are small and potentially in the habitable zone (HZ) of their parent stars. Rock soil droplets formed by heating most likely came from Stone Age house fires and not from a disastrous cosmic impact 12,900 years ago, according to new research from the University of California, Davis. How do you make an Earth-like planet? The "test kitchen" of Earth has given us a detailed recipe, but it wasn't clear whether other planetary systems would follow the same formula. For life as we know it to develop on other planets, those planets would need liquid water, or oceans. The remarkable discovery of many planets and candidates using the Kepler telescope even includes ten planets orbiting eight binaries. Three out of the eight, Kepler 16, Kepler 47, and KIC 9632895, have at least one planet in the circumbinary habitable zone (BHZ). A research team led by LSU Geology and Geophysics Assistant Professor Suniti Karunatillake reveals a spatial association between the presence of sulfur and hydrogen found in martian soil. Remarkably, this is the most compact system ever found, being characterized by a concentration of dynamically packed planets below 0.1 AU with adjacent planet pairs lying close to strong 5:4, 4:3, 5:4, and 5:4 orbital resonances.